I’ve decided a little while back that I’d love to make embroidery wall art to sell in my Etsy shop, but I had no idea what to actually embroider. I am not the best artist, though I should probably just pick up a notebook and start sketching. Anyways, I have been a total nerd and watching an anime, Fullmetal Alchemist lately. I kept thinking, how cool would it be to embroider the alchemy circle, but then I though again. It’s totally got to be trademarked and I don’t want my shop taken down!! Then I struck gold. I LOVE Voodoo. Ever since I was little, I thought it was just amazing. I love that movie, The Skeleton Key, even though it’s absolutely terrible. Just the lure of it is overwhelming to me. 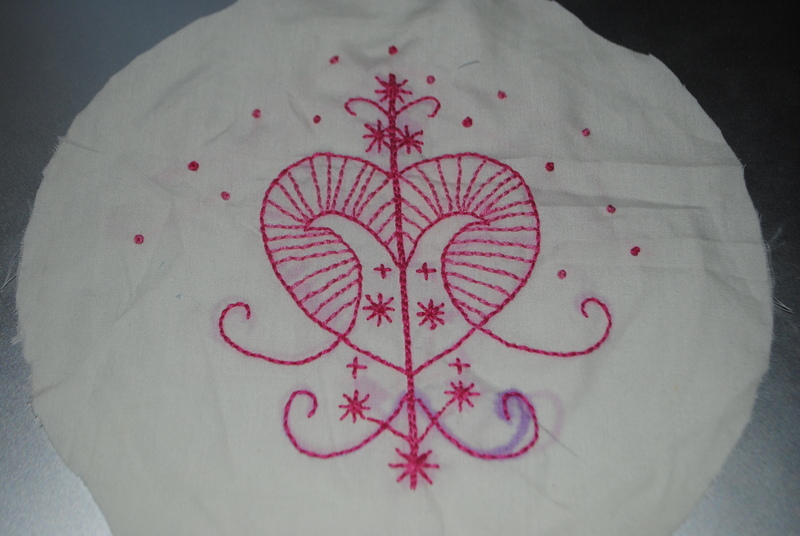 So I decided to start embroidering the veve of the iwa, spirits. Each Iwa, or spirit, has a veve, symbol, that you use to call them forth. Usually they are made on a floor or the ground with corn meal and there is ceremony involved, all very secret. I find the veve to be absolutely beautiful. There are a lot of variations of each veve and perfection is not the key!! I am just waiting for the marker to fade and then I will get the wrinkles out and place them back into the hoop, seal up the back and then I can post it up on my Etsy page!! This entry was posted in Art and tagged art, embroidery, erzulie, etsy, pink, veve, voodoo, voudou by themcdorkins. Bookmark the permalink.